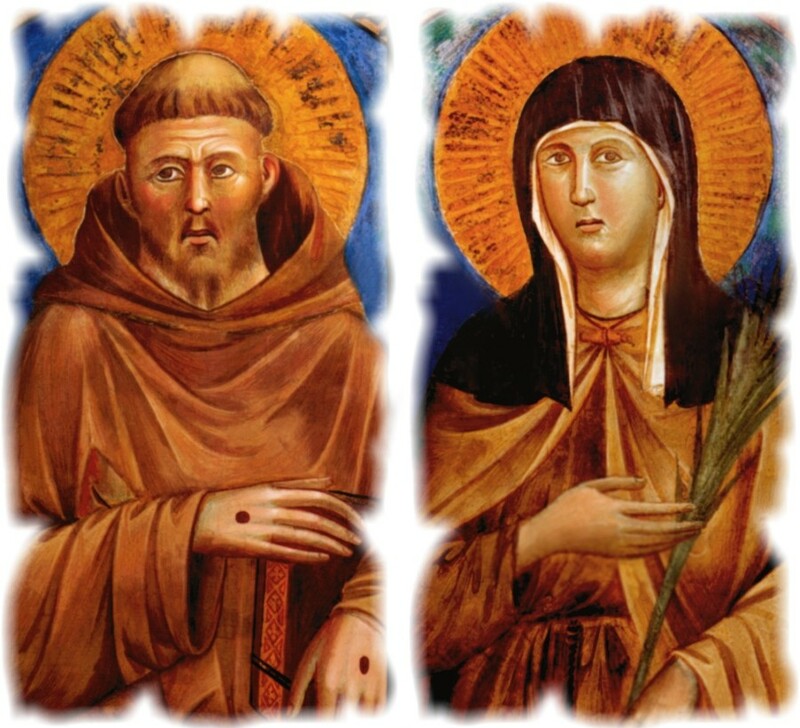 Did you know that both St. Francis’ parents and St. Clare’s parents vigorously opposed their vocations? St. Francis’ parents thought he was foolish to give up the inheritance of his father’s successful merchant business and profess vows of poverty and prayer. His father had become incensed to such a measure that Francis hid himself in a cave near the church of St. Damian for a whole month to avert his wrath. When he emerged from his hiding place and returned to town, he was followed by a mob that pelted him with mud and stones and called him a madman. Francis’ father then dragged him home, beat him, bound him, and locked him in a dark closet. St. Clare was eighteen years old when St. Francis came to preach the Lenten course in the church of San Giorgio at Assisi. His words inspired her heart and she sought him out secretly to ask if she might also live “after the manner of the holy Gospel”. St. Francis recognized that this was a true desire and promised to assist Clare. On the night of Palm Sunday, she secretly left her father’s house by St. Francis’ advice, and along with her aunt and another woman went to a chapel to meet St. Francis and his companions. There, she laid aside her worldly life and vowed herself to the service of Christ. St. Francis placed her initially with the Benedictine nuns of San Paolo. Clare’s father had intended her for marriage. He was greatly angered, not only by her refusal to follow his plans, but also by her leaving his house in secret. Upon discovering where she was, he did all that he could to dissuade her from her vows, and then tried to drag her home by force. But Clare stood firm in her convictions, even grabbing the altar in the chapel so that she could not be dragged away. Convinced that he could not dissuade her, her father was finally obliged to leave her in peace. As parents, you have hopes and dreams for your children. You want many things for them, but ultimately you want their happiness. For the parents of Sts. Francis and Clare, their own desires for their children’s’ futures blinded them to what Christ was calling their children to do. 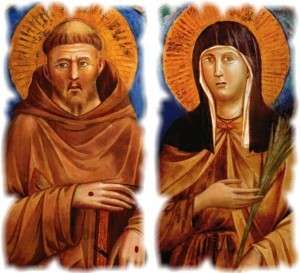 But St. Francis and St. Clare knew God was calling them, and were courageous enough to say “yes”, thereby finding true happiness. In the same way, God has given each of your children a vocation – a way that he has called them to give themselves to Him and to the world in love. Today, there is a beautiful statue of St. Francis’ parents in Assisi. They are famous because their son became a friar and founded the Franciscans, which is the largest family of religious men and women in the world. Parents, encourage your children to follow God’s will for their lives. It is only in generously responding to Christ that they will find the happiness you desire for them.